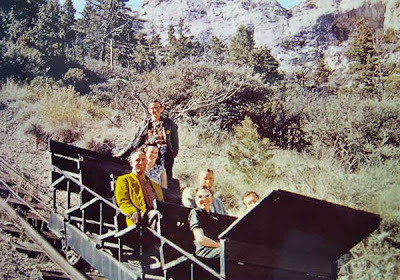 Speaking of Montana's state parks, this might be a good time to pause and remember what was undoubtedly the most beloved attraction in the entire state park system -- the tramway at Lewis & Clark Caverns. A small load of tourists headed heavenward en route to the cavern entrance. The cabled chariot lifts 16 calm people or 12 nervous people 435 feet up a 71 degree grade. It deposits the thankful cargo just below the cave entryway. I was lucky enough to ride the tram as a kid, and I still remember the experience. Tragically, though, it was shut down by a heartless state government in 1973, and the railway disappeared three years later. Visits to the cave just haven't been the same since.